It’s yellow jacket and wasp season and they seem to be particularly annoying this year. Even the firefighters out on the wildfire lines are being painfully plagued by them. Yellow jackets seem to be the biggest problem right now but hornets and paper wasps aren’t far behind. Yellow jackets are mostly black with distinctive yellow stripes on their abdomens. They are ground and cavity nesters who move into old rodent holes or wall cavities. As a result, their nests are often hard to detect and even harder to get rid of. In the fall, yellow jacket nests die off save for the queen who overwinters and begins looking for a new nest site in early spring. Through the spring the new yellow jackets are busy catching other insects to provide protein to the larvae. In this way, they are a beneficial insect in the garden. In late summer, the nests stop growing and the yellow jackets start looking for sugars at, where else, our picnics. Most flowers have finished blooming and water sources are drying up in the heat, so we become the source of last resort. Hornets and paper wasps exhibit basically the same behavior. Hornets are larger than yellow jackets and tend to be black with white stripes. They build large, papery, cone-shaped nests from eves or tree branches. Paper wasps have a large abdomen attached to the thorax by a long, thin waist. Their nests are open bottomed umbrellas attached to a limb or eve by a thin stalk. You can easily observe them coming and going. All of them but particularly yellow jackets and wasps will vigorously defend their nests. 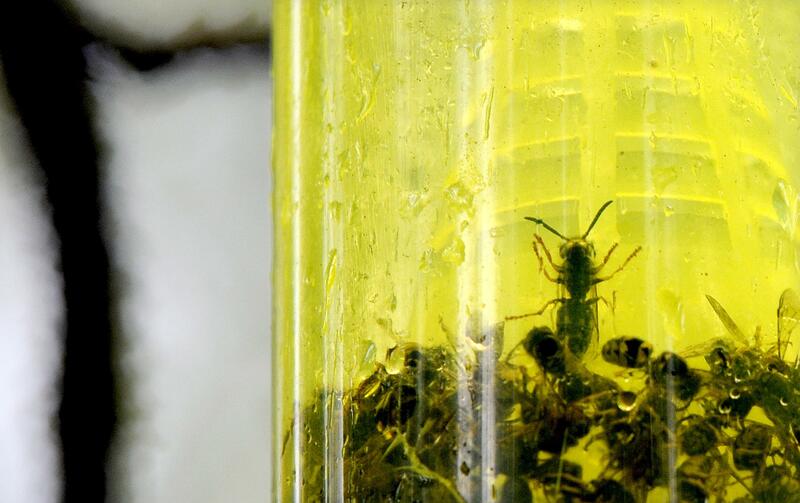 Their stingers are not barbed like honey bees, so they can sting repeatedly. The first thing to ask if you encounter a nest is whether the nest is truly in an area where people regularly gather. If it isn’t, let it be; it will be dead in a couple of months anyway. If it it’s close, the best choice is to get a professional to handle the removal. There are wasp and hornet sprays on the market, but they need to be applied at night when the insects are home. Aim your spray at the nest entrance and soak the hive. If the yellow jackets are in a cavity and you can find the nest entrance, spray directly in the hole and run. You may have to do repeat sprays. To keep them away from you for the rest of this summer, place traps baited with meat, fish or cat food well away of gathering areas. Change the bait frequently as yellow jackets like their snacks fresh. Pheromone traps placed around the garden will attract yellow jackets by scent; they can enter the trap and can’t get out. A local Spokane company Rescue makes a very popular version of this trap. However, the very best time to control yellow jacket populations is in the early spring when the queens come out to nest. Hang the pheromone traps in late March and every queen you catch is a nest destroyed. Pat Munts has gardened in the Spokane Valley for over 40 years. She is co-author of “Northwest Gardener’s Handbook” with Susan Mulvihill. She can be reached at pat@inlandnwgardening.com. Published: Aug. 16, 2018, 6 a.m.